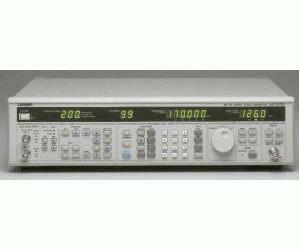 The LG 3236 Synthesized Signal Generator covers a frequency range from 100 kHz to 170 MHz and provides AM and FM stereo modulation capability. A high accuracy crystal controlled reference oscillator, 5 ppm, ensures accurate and stable RF carrier frequency output. Electronic step attenuation extends repeatability and service life for the RF output while eliminating contact bounce and transient noise at low RF levels. RF output level ranges from -20 dBμ to 126 dBμ where (0 dBμ equals 1 μV into an open circuit) in 0.1 dB steps. Combine this with a standard GPIB interface and the unit is a natural for automated production and inspection applications. GPIB programming is expedited by using the 100 presets to store frequency, output level, modulation deviation or depth, stereo pilot with level to internal memory. Just recall the presets as needed to cycle through the test routines as needed. FM stereo separation is 55 dB or better and distortion is 0.05% or less. Simultaneous FM/AM modulation capability is available as factory option. Installing the Option 70 adds another modulation oscillator and the capability of simultaneous FM/AM modulation including different modulation frequencies. The LG 3235 comes with AM/FM monaural modulation capabilities standard. All front panel switches, except for the power switch, can be remotely controlled via the 24-pin connector on the rear panel.